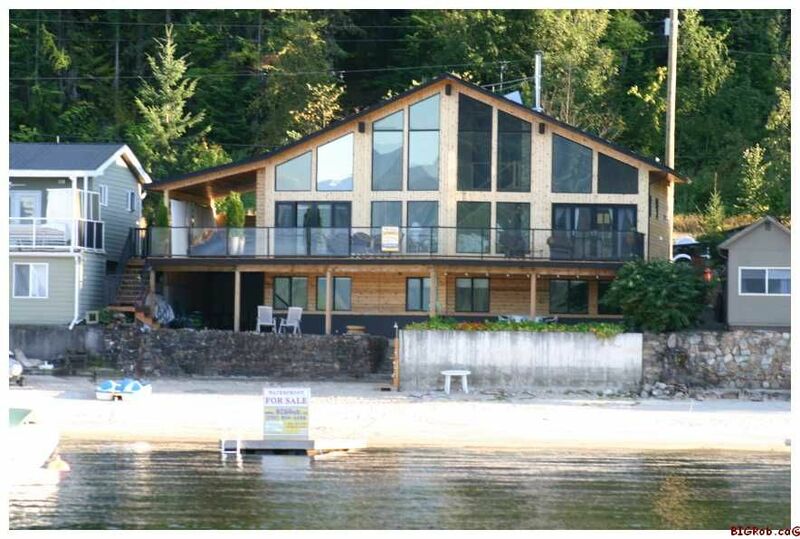 Waterfront Dream Home on Shuswap Lake! CLICK HERE for a Comprehensive SLIDE SHOW with over 100 Photographs! 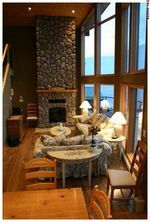 This home was constructed by the Seller in 2007 where they custom designed every square inch to properly suit the lakefront lifestyle. As a 2nd generation heir to this very property, the Seller grew up on the Shuswap Lake right at this very location! They enjoyed a family cabin here that was owned by their parents and then raised their own children here too. Avid boaters and water skiers, the Sellers have a lifetime of experience not only enjoying the Shuswap waterfront, but also enjoying this very thought. Every window, deck, door and wall where carefully placed in the exact perfect location! This home is amazing! From the moment you walk into the front door your breath is taken away by the panoramic lakeviews through the cascading living room windows that reach from wall to wall and ceiling to floor in an "A" shape pattern. 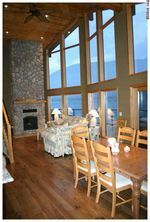 The views are magnificent and you literally feel as though you could step right into the lake.... EXACTLY what you'd ever want in a lakefront home! 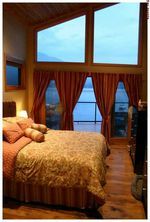 Every room in the home except for 2 have perfect lakeviews! The "A" framed layout offers a loft area with a 2nd Master Bedroom and a fully walk-out finished basement. 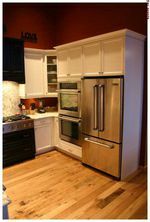 No expense was spared for quality or workmanship and upgrades are abundant throughout the home. Vaulted cedar ceilings, cedar siding, a perfect outdoor living room area (not included in sqft) and a huge lakeside sundeck. The main floor offers the front to back Master Bedroom with its only double glass sliding doors that lead out to the lakeside deck. Appointed by a "spa-like" ensuite with a corner soaker tub and European glass enclosed walk-in shower. 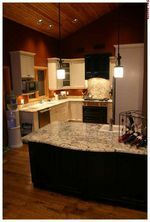 Granite Counter, Heated tile floors and huge vaulted ceilings add to the luxurious feeling! You'll love waking up to your own personal lakeview every morning! 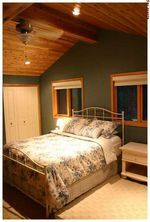 The main floor also offers a guest bedroom next to a full bathroom. There are 3 Bedrooms upstairs and 3 Bedrooms downstairs and the home will comfortably sleep over 20 people. Hardwood floors, High-end custom wood windows and doors with exterior pre-finished aluminum cladding, solid wood interior doors, quality hardware, floor to ceiling rock clad fireplace with wood mantle and custom light fixtures mixed with directional pot lighting throughout. The Sellers aren't only Shuswap Waterfront grown, they are chefs that passionately enjoy cooking and entertaining..... You'll love the gourmet dream kitchen appointed with granite counters, high-end stainless steel appliances, huge bakers island with breakfast bar, two sinks all embraced by the hand crafted custom cabinetry! 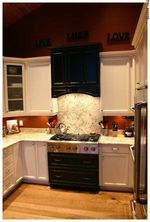 If you love to cook and entertain at the lake, then this home will be heaven on earth for you! As beautiful as this home is, Summer is all about the outdoors and this home embraces the Sandy Beaches and Lakeviews with several outdoor entertaining areas including a gorgeous tiled outdoor living room that has perfect privacy and vaulted cedar ceilings! The custom built-in sound system extends throughout the house with volume zone controls and you'll enjoy your favorite tunes while enjoying the outdoor decks too! The covered outdoor living room wraps around and connects to the lakeside sundecks that extend over 50 feet long and are enhanced with glass railings and direct stairs that lead onto the sandy beach and connect to the lower covered patio areas including another covered patio area off the lower family room. 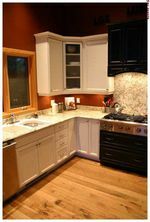 There is no shortage for storage of all the toys including a lower level mud room/ski locker and extra fridge/freezer storage area too. 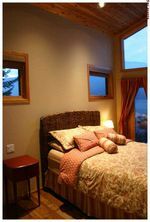 Every room is a healthy size including the lower level bedrooms and family room. The Sandy Beach hosts your own personal floating dock that provides perfect sun tanning all day long as well as a floating boat buoy. A good portion of the original rock retaining wall was restored and provides a connection to the properties heritage providing a feel of character to the beachside areas. You'll love the outdoor shower and foot wash perfectly located just off the sandy beach. 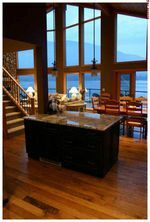 If you're looking for a year round recreational property that has everything a Shuswap Waterfront property could offer, then your search can stop..... this home is breath taking and stunning! You will be proud to build your generations of family memories here too! 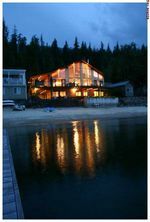 Located just outside of Sicamous, the location is perfectly set along the shores of Annis Bay.... no previous lakefront home has been offered for sale to the public along this beach before, truly a unique and rare opportunity! Be sure to enjoy the comprehensive SLIDE SHOW presentation herein, then call Rob for your personal viewing appointment today! You'll be glad YOU did.